Sōmen (素麺) is very thin Japanese noodles made of wheat flour. The noodles are usually served cold in summer with a dashi flavored tasty dipping sauce called Mentsuyu (めんつゆ). Topping ingredients are optional, so you can skip them, but the easiest is ham, egg, and cucumber. 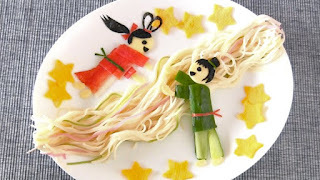 Somen is perfect dish to serve on Tanabata, which is a festival celebrated on July 7th. People write their wishes on strips of paper and hang them on bamboo trees. Moreover, there is a Tanabata story. I don't think the story is that romantic, but it is about Vega (Orihime 織姫) and Altair (Kengyuu 牽牛(彦星)). They fell in love with each other but without working. So the emperor (Tentei 天帝, Orihime's father) decided to separate them on opposite sides of the river of the Milky Way. Now they could see each other, only once a year on Tanabata July 7th, if they work hard. *instead of using Kamada Dashi Shoyu you can use regular Mentsuyu but make sure you dilute as instructed because the level of concentration vary from product to product. Kamada Dashi Shoyu is 4 or 5 times concentrated to make Mentsuyu. Beat 1 egg in a bowl (you can season it with sugar or salt). Heat cooking oil in a pan and make a thin omelette. If you don't have a rectangle omelette pan, you can make a circle thin omelette. Then cut the egg, cucumber, and ham slices into thin strips. Mix A, B, C separately, and keep them cool in the fridge until ready to serve. Boil water in a large pan. Add dried Somen noodles in the boiling water and gently stir noodles with chopsticks. Cook Somen noodles according to your package (mine was 3 min). Drain the noodles in a strainer and rinse the noodles with hands under running water. Then soak them in a bowl of iced water to chill. Take bite-size portion of the noodles and roll them on your finger (like you roll pasta on a fork), and place them on a dish. Serve before the noodles absorb too much water. When Somen noodles get dry, their gluten get strong and sticky. So they will stick together nicely in bite-size portions. When you eat, dip one portion in the dipping sauce, then shake to release the noodles. Did anyone realize my mistake? !